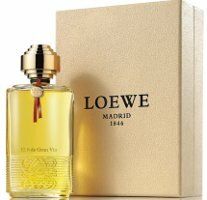 Spanish luxury brand Loewe has launched four new fragrances in their Colección Un Paseo por Madrid. El 8 de Gran Vía, Ópera en el Teatro Real, Amanece la bella Cibeles and Las tardes de Capricho bring the series total to eight, all "inspired by the splendour of Madrid...[and the] evocative, dreamy and majestic strolls that only the capital city can offer". El 8 de Gran Vía (shown) ~ "El 8 de Gran Vía, Loewe’s mythical boutique of the 1930’s. Floral notes such as the rose accompanied by vetiver and pepper notes." Ópera en el Teatro Real ~ "Ópera en el Teatro Real. Our five senses invaded with fresh and spicy notes like jasmine, bergamot and Benjui of Sian." Amanece la bella Cibeles ~ "Amanece la bella Cibeles. Generous in passion and strength, this icon invades us with sensual aromas like the rose and vanilla and flowers such as the iris." Las tardes de Capricho ~ "Las tardes de Capricho, enclave where the passerby is refreshed with the aromas of Yuzu, freesia and the woody notes of cedar and sandalwood." The Loewe Un Paseo por Madrid fragrances are available in 100 ml Eau de Parfum, €225 each. 100ml for 225 Euros?? I can get a double size Chanel Exclusifs for not much more!! They are very spendy, no? I guess this is their top-of-the-line collection, and I think it’s not exactly a bargain brand anyway. I knew they were supposed to be a luxury brand – have a pair of sunglasses from them, which are pretty luxe but fantastic quality, admittedly – but their perfumes always struck me as nothing more than average non-descript fruity florals – sweeter twists on classic colognes, that sort of thing. Maybe they are trying to target their core customers. I can’t really see any of their pastel tinted fruity confections really matching the aesthetic of their ads for their bags, for instance. Thanks for the info. Their leather goods are really top draw. (Way too top draw for me). I have often seen their frags on discount and wondered if they were worth chancing. Doesn’t sound like it, since I generally avoid sweet scents. The best is the ‘Agua de Loewe’ scent – which is cologne-y citrus tea. Yes, although that’s what lots of luxury brands do, right? My mum liked El Cielo Sombre La Plaza de Oriente from Loewe boutique line, she got it in a thrill store at a bargain price.